The excellent Batman: Arkham City is now on sale for the Xbox 360 and PlayStation 3, and we want you to have the best possible time with it. So, before you start, here are some tips from us about how to get the most out of the game, right from the start. 1) Don't worry about having played the first game, but do read a plot summary. There are lots of references to the Titan forumla and the state of various villains. Brush up on your Arkham Asylum lore (the plot summary in Wikipedia should help) and you'll appreciate all that a lot more. 2) Get that Catwoman DLC, and get it before you start. As we've noted, the ability to play as Catwoman is available only once you download about 200 MB of data. Do that before you start, because it will affect how the game begins. The new Catwoman intro isn't great, but her later missions are good (plus, she's fun to play as, as you can see here). You can get access to the Catwoman content by redeeming a code bundled with new copies of the game, though some retailers may give you a code even if you buy the game used (and, if not, you can buy it online for $10). 3) Don't play on easy. First of all, the game isn't that hard. Second, you can only access the game's second New Game Plus play-through if you've finished it on Normal or Hard. 4) Get into fistfights. 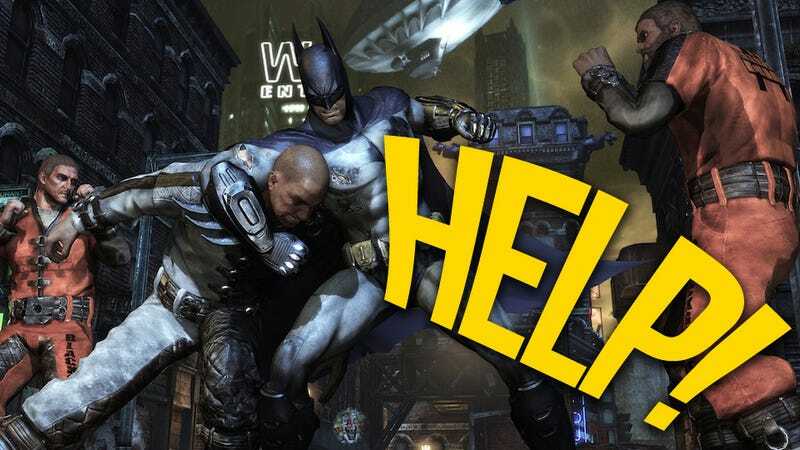 One of the beauties of development studio Rocksteady's Batman series is that you can button-mash through it and have a good time, but you can have an even better time fighting through each skirmish with the precision you'd normally reserve for playing a rhythm game. The best way to get that rhythm is to practice, practice. So send Batman down to the streets and make him punch people in the face. Or the ribs. Or the back. Or put his foot in their gut, on their jaw. Etc. 5) Do the AR missions as soon as you can get them. In the first hour of the game you'll unlock four augmented reality missions. Do them all, as they unlock a tool that is extremely useful for getting around in the game. Don't leave this sidequest to the side. 6) Don't sweat the Riddler stuff right away. The game is packed with Riddler clues to solve, Riddler trophies to collect and Riddler challenges to complete. There are 400 Riddler things to do even if you don't have the Catwoman content (at least 40 more if you do). It can be overwhelming and a little confusing, since you'll often see Riddler trophies or challenges tucked into the corners of Arkham City as you swoop through town en route to your chosen mission. You may worry that you'll never find that Riddler thing again. Don't worry! Early on, the game will introduce a technique (holding-down of the left bumper on the Xbox 360 controller) that lets you tag Riddler items that you spy. Tagging them adds their locations to your map. But even that isn't a must. A few more hours into the game, you'll be given a very obvious method for getting Riddler item locations added to your map. This isn't like GTA's hidden packages or Assassin's Creed's treasure chests. You won't need to go find a walkthrough. Before long, you'll have all the tools to track these 400+ items down without every consulting an online hint guide.